Figure 2. Door Lock Tabs Placement. Figure 3. Door Lock Tabs Installation. Use extreme care not to grind or cut through the shelter skin. Grind welds (Figure 1, Item 2) from damaged door lock tabs (Figure 2, Item 1). Drill out two rivets (Figure 1, Item 3) attaching door lock tabs (Figure 2, Item 1). Remove door lock tabs (Figure 2, Item 1). Burnish skin surface of paint and epoxy down to bare metal. 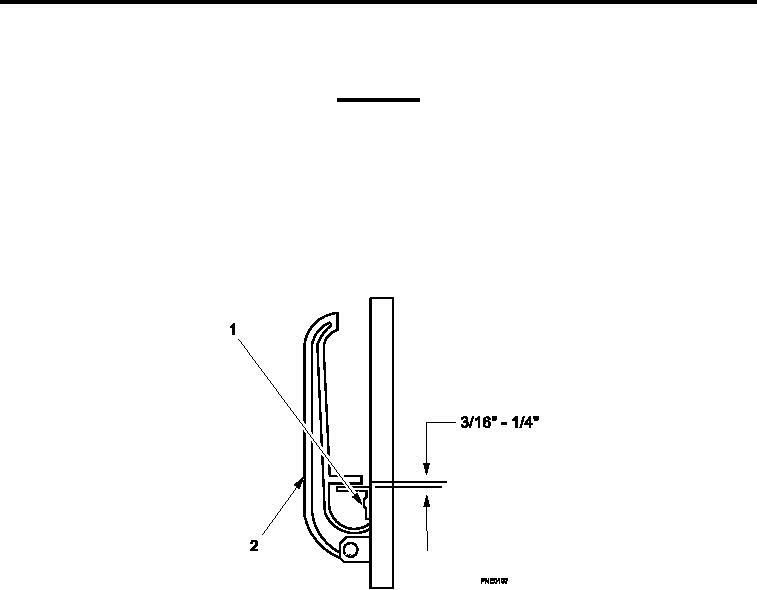 Install door lock tabs (Figure 2, Item 1) by using latch handle (Figure 2, Item 2) as a guide to position. Mark position of door lock tabs (Figure 2, Item 1). Deburr all holes and clean off all metal shavings. Dip rivet s mandrel in polysulide sealant before inserting into drilled holes. Position door lock tabs (Figure 2, Item 1) and insert two rivets into two pre-drilled holes.